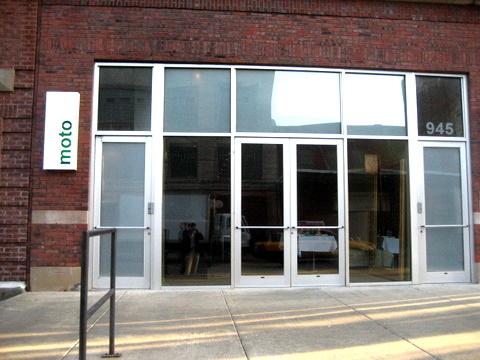 Moto is arguably the most innovative restaurant in Chicago, rivaling the vaunted Alinea in terms of novelty. The restaurant's location is equally as innovative, located in a dank fetid alley among nondescript warehouses and industrial buildings, very reminiscent of the environs around R23. 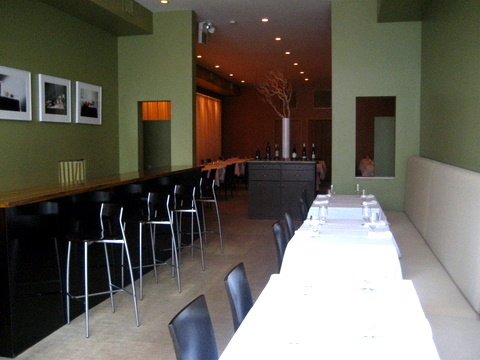 Entering the restaurant, one leaves all that unpleasantness behind and enters a olive green lounge and bar area. In the back, a handful of simply appointed tables make up the main dining room. For a restaurant known for its innovative cuisine, the decor is surprisingly conservative. 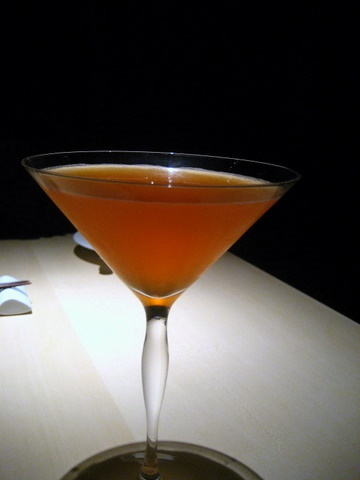 All fairly stiff, this drink can be a dangerous way to start a meal when taken in addition to the wine pairing. Not a huge fan of the drink initially, the brandy and gin leaving an overly harsh initial impression though the sweetness from the frozen grape altered the balance, providing a much more nuanced flavor. 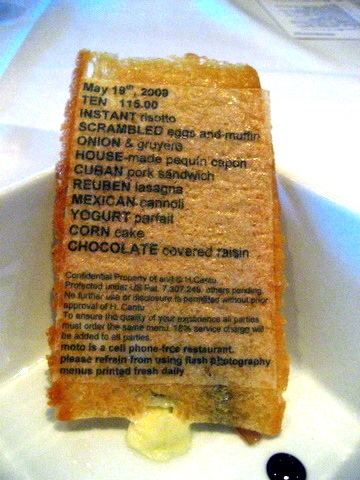 One of Moto's trademarks is the menu presented on edible paper. The restaurant offers a 20-course menu and a 10-course menu that is a subset of its larger brethren albeit with misleadingly different names. The menu is presented here in lieu of a traditional bread course. 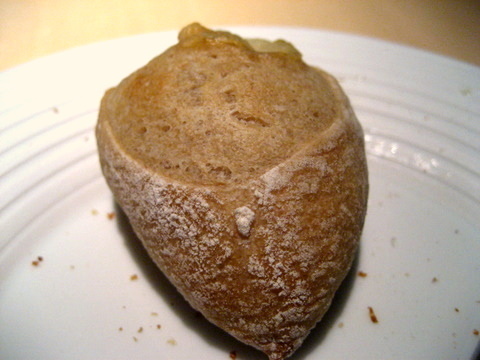 The garlic bread is toasted with a dry garlic essence that benefits from the sharpness of the ramps and butter. The meal jumps right in with a heavy course of fish and rice. 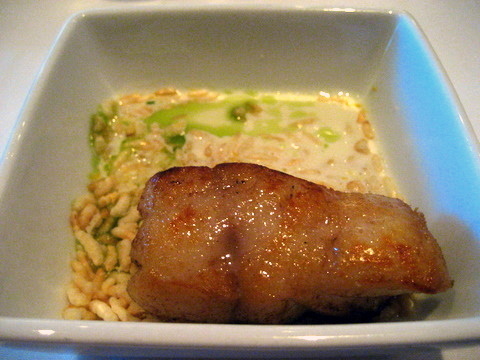 The texture of the crisped rice was unique though I still prefer the softer complexion of traditional risotto. 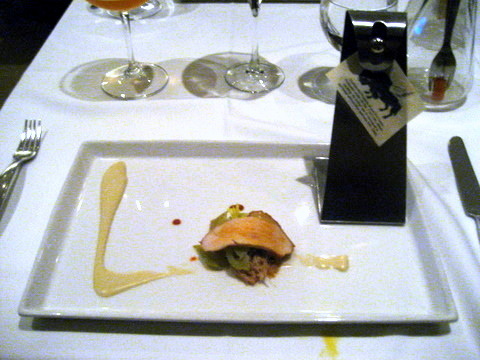 The fish is a blueberry bass, named for its color not its flavor, was deliciously dense with a pleasing savory flavor. The sauce, a blend of basil oil and Parmesan formed a nice savory compliment to the fish. Our first wine was a prototypical champagne, offering a more yeasty attack than the GV sparkler we had last night. The next course is a deconstructed Gazpacho presented as traditional breakfast items. 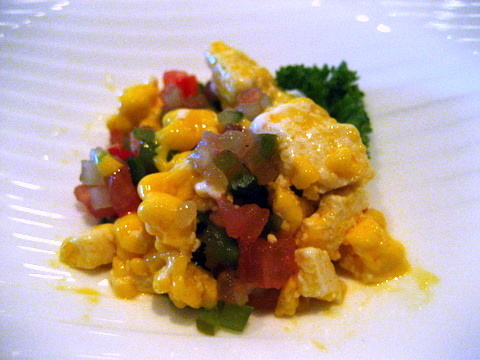 *Scrambled Egg of Carrot and EVOO with cucumber, jalepeno, and tomato - The core of the gazpacho the "egg" had a tofu-like texture imbued with a sweetness from the carrot and EVOO which complimented the bracing diced vegetables. 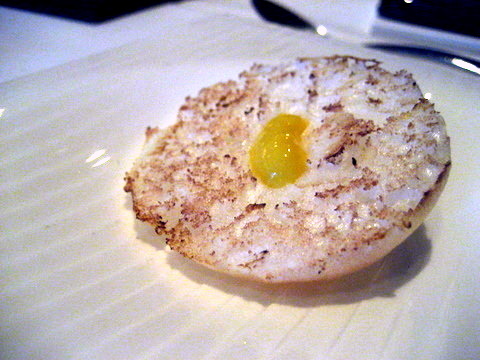 *Puffed Garlic English Muffin with Vegan Corn Butter - The "muffin" has a texture almost like whipped meringue, airy and light but loaded with intense garlic flavor. Individually each component has its charms but eating them together brings out a complex interplay between the three parts that flawlessly emulates the flavor of traditional gazpacho. The wine, a riesling Spatlese had a rich honeyed nose and crisp acidity that complimented the tartness of the egg and vegetables. 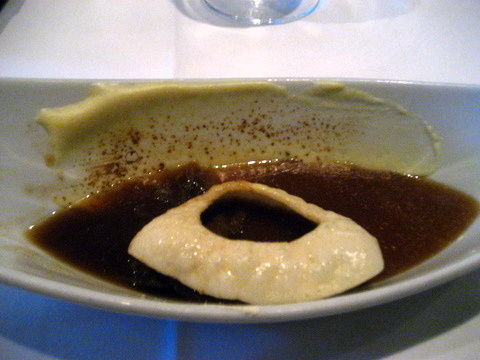 A surprisingly traditional french onion soup, this was served with an onion chip rather than croutons but aside from that the rest of the ingredients were completely textbook, tasty but lacking the adventurous spark of the previous two courses. 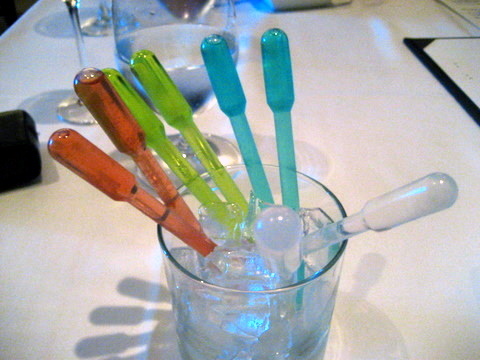 Like the Martini Library, this course consisted of liquid in a pipette. The liquid was imbued with the essence of cucumber, tomato, oregano, and onion. 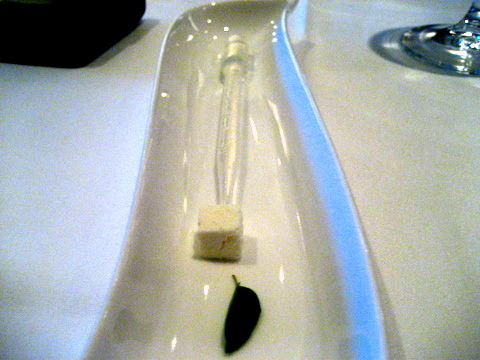 A small block of feta cheese served as a stopper and provided the last component needed for a classic Greek salad. 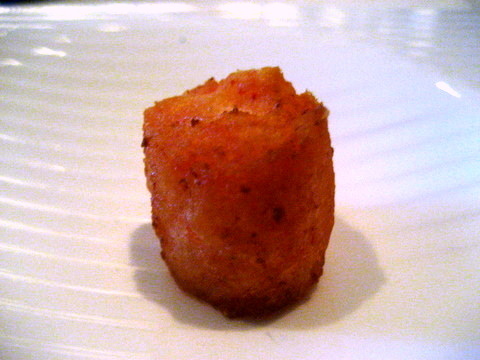 Next up was a small dish of Monkfish Fries that reminded me of the abysmal Chicken Fries at Burger King. Fortunately this was actually well-executed, with the fish exhibits a chewy texture reminiscent of squid, perhaps a touch salty but that is to be expected with fries.. The smoky chili cheddar was a natural pairing for the fish and both my friend and I agreed we could snack on these for hours. The GV was a crisp refreshing wine though perhaps a more full-bodied choice would have been appropriate with to match the intensity of the sauce. 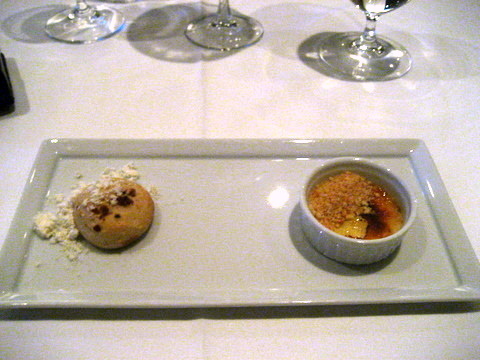 There were two separate parts to this dish, a bacon cookie and a honey-soy-maple crème brûlée. The cookie was initially quite sweet though the smoky presence of the bacon, and decadence of the white truffle powder put this bite squarely in the realm of the savory. 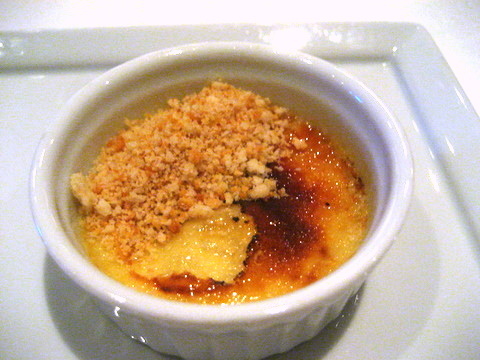 The crème brûlée was a bit restrained the soy and honey sort of canceling each other out leaving a muddled savoriness that allowed the creamy texture of the dish to dominate. 07: SEARED buffalo hot wings - HOUSE-made pequin capon? One of my favorite courses of the night. 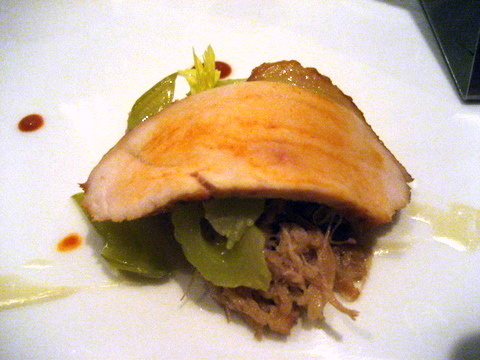 The chicken and celery tasted reminiscent of chicken noodle soup with a hint of spice. 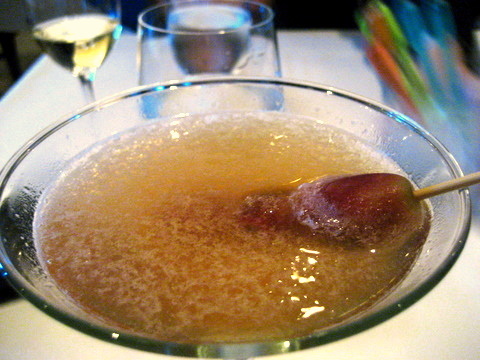 On the side is was a purée of celery and blue cheese providing a slightly sour tang. The concentrated buffalo sauce comes in paper form with a rough texture that dissolves into pure flavor as soon as it hits the tongue. The buffalo wings were paired with a beer from Unibroue a Canadian brewery that is fast becoming one of my favorites. The End of the World has a hazy blond color and complex blend of spice that compliments the spicy buffalo sauce while refreshing the palate. 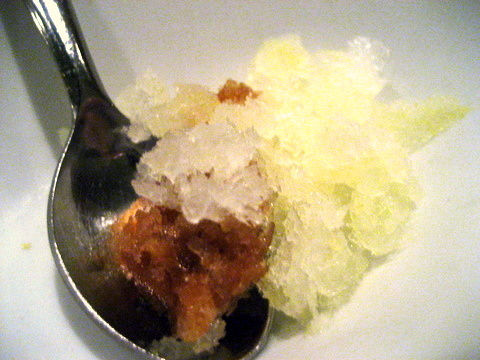 The Arnold Palmer is a drink composed of 50% iced tea and 50% lemonade, served here as a granita to give diners a break midway through the savory courses. I found the flavor of the tea was muted by the tart lemonade though the entire dish had a faint saltiness that was quite disconcerting. This was a bit of a science experiment as we were given a beaker with a piece of salmon and thyme smoke that was smoked at the table. 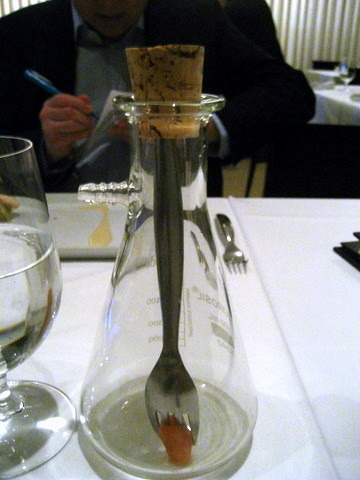 The beaker came with a small spout on the side that let you sample the woody aroma of the smoke trapped within. 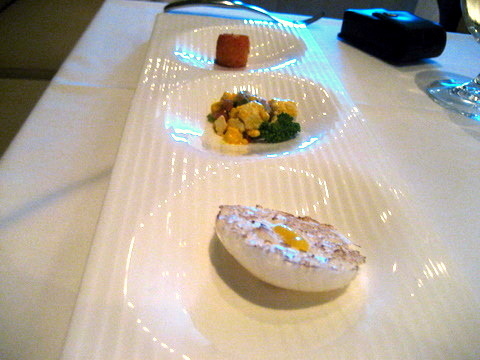 After smoking through two courses we were presented with a dish containing cream cheese and bagel croutons. The fish had chewy dense partially dehydrated texture something like a fish jerky. The intensely powerful flavor of the fish was balanced somewhat by the bagel and cream cheese though the aroma of the smoke lingered long after the course was finished. A fairly smoky wine, not surprisingly the flavor is severely muted after eating the fish. The Cuban sandwich is a sandwich popular with cuban workers that consists of ham, roasted pork cheese, pickles and mustard. 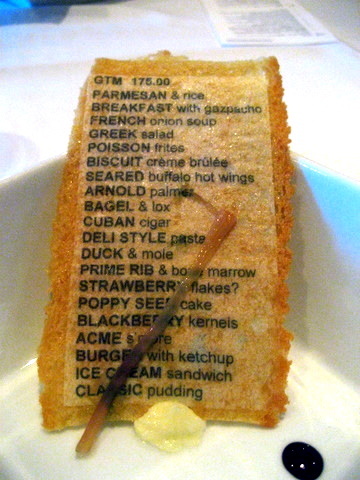 The sandwich was popular with workers in the cigar factories hence the presentation of a Cuban sandwich in the shape of a cigar seems oddly appropriate. The sandwich here is a slight variation on the original, using a collared green leaf for a wrapper and stuffed with white bread, pulled pork, pickled cucumber and onion, cheese, and roasted red pepper purée. 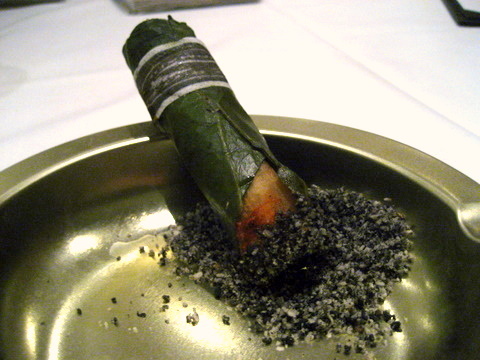 The "cigar" was dusted with a powder of white and black sesame seeds to mimic ash and ringed with a band of edible paper. A tasty sandwich, the moist rich pork and cheese contrasting deftly with the bitter pickle and bitter greens but this was definitely more about look than taste. This course was a bit too similar to the previous course, the combination of corned beef and sauerkraut very similar to the rich pulled pork and pickle flavors of the Cuban. Like the last course this was tasty, though aside from being presented in a very non-traditional form, nothing particularly special. This late into the meal you'd think I'd learn never to trust my eyes at Moto. 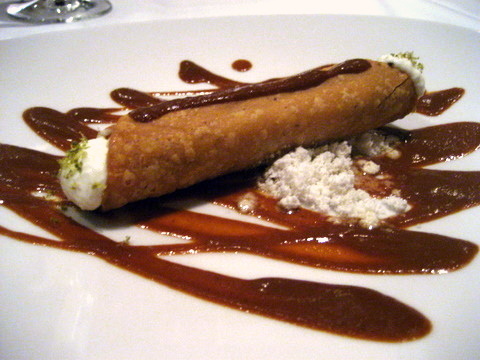 This looked like a cannoli stuffed with cream but was actually shredded duck in a fried corn tortilla. The tortilla and duck ended up reminding me of a taquito, with a strong corn flavor followed up by the flavor of the meat blended with tangy sour cream and dark smoky molé. A nice blend of fruit, mint, and spice the wine stood up well to the heat of the jalapeno and molé. 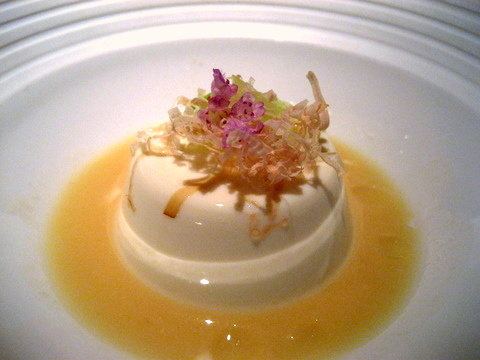 This course started out as a bowl of vanilla flavored soymilk. 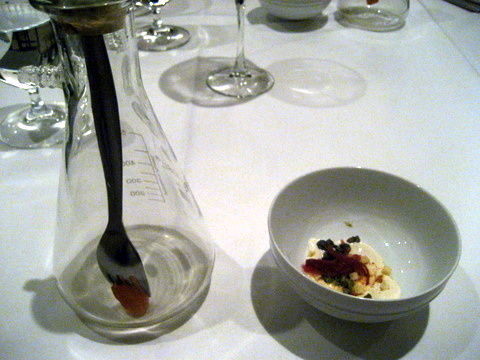 Our server brought out hissing, smoking copper pot filled with corn flakes and strawberries in a bath of liquid nitrogen. 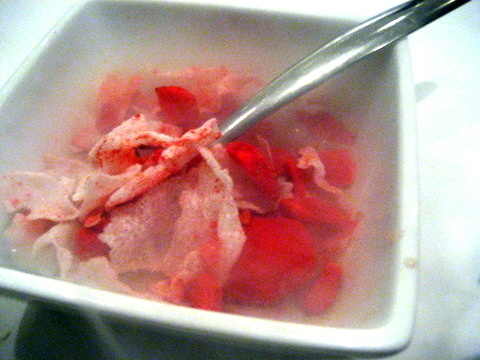 Eaten quickly, this had a smoke effect similar to the Dragon's Breath at The Bazaar. I am a bit embarrassed to say I choked a bit when eating a strawberry particularly saturated with liquid nitrogen though my companion said I actually blew out quite a bit of smoke during my coughing fits. 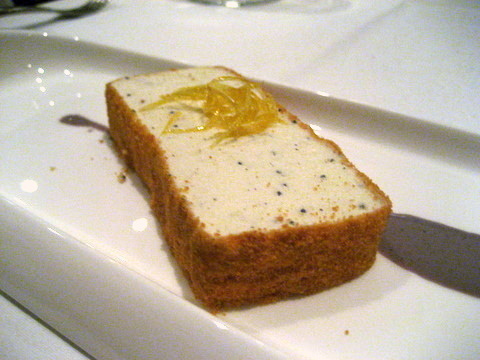 A wonderfully simplistic dessert a poppyseed ice cream presented in crumbs so that it looked like a cake. 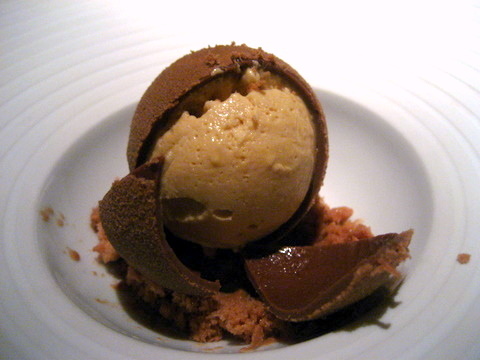 The texture of the ice cream was so light and airy it almost felt like a slice of actual cake. Fantastic interplay between the poppyseed's nutty herbaceous flavor and the flashes of citrus from the lemon. Riding high after one of the most memorable slices of cake I have ever had, this was a painfully rapid plunge. 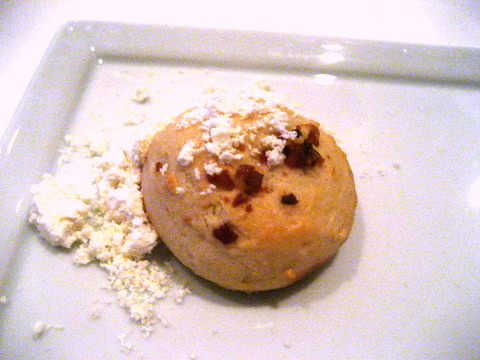 The corn cake was similar to a muffin or corn bread, dense and with a slight sweet/savory touch. 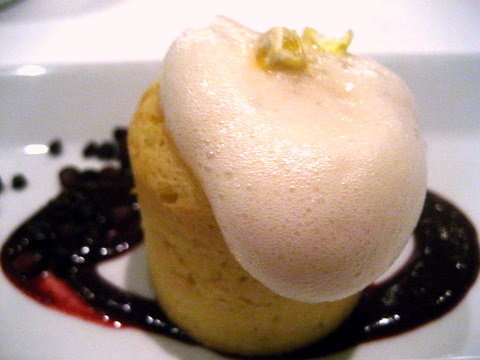 The blackberry and corn combination felt very blunt and unfocused. I suspect the name is a clever reference to ACME Corporation made famous by the Road Runner/Wile E Coyote cartoons. We were brought small morsels or chocolate that looked for all the world like a bomb out of Looney Toons complete with a marshmallow "fuse". 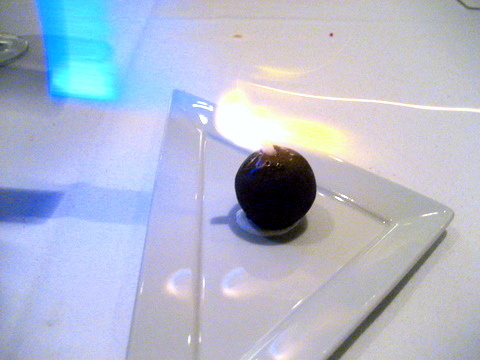 This impression was further strengthened when our waitress used a blowtorch to light the "fuse" then told us to eat the chocolate in one bite. 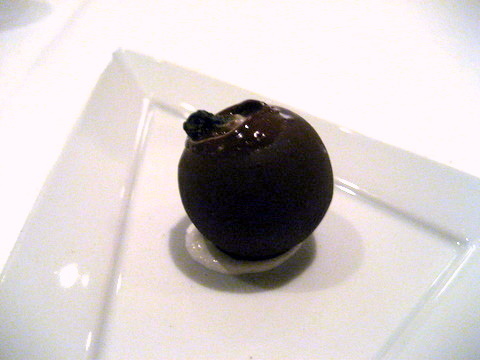 I got an initial sense of the burnt sugar's bittersweet flavor combined with a simple bitter chocolate. 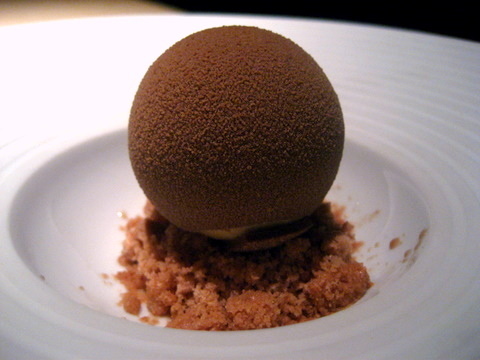 The orb was filled with a liquid graham cracker which rounded out the traditional elements of a S'more. 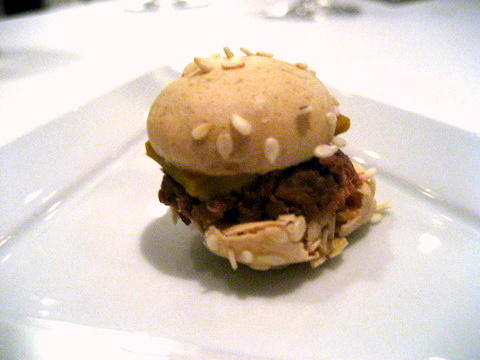 Aside from looking like the world's smallest burger, this was a pretty lackluster course. Effectively this was a macaron dressed like a burger, complete with a peanut "bun," chocolate "patty," and an actual slice of lettuce. The lettuce was a bit lost and the interplay between the peanut and chocolate reminded both me and my companion of a Snickers bar. The aroma of the wine was pretty much what you'd expect, lots of candied fruit and honey but there was none of that on the palate, making this a very light dessert wine that was easily overwhelmed. 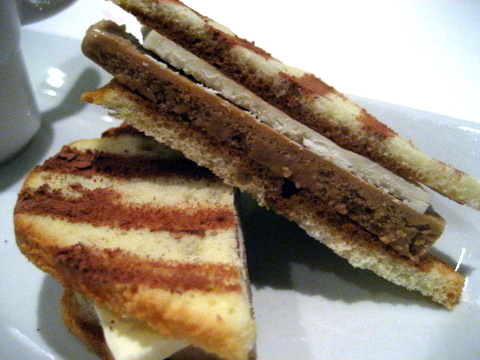 The sandwich was a combination of marscarpone and coffee ice cream between two slices of ladyfingers dusted with cocoa powder. Perhaps the flavor balance was off but this didn't really taste like a tiramisu to me. 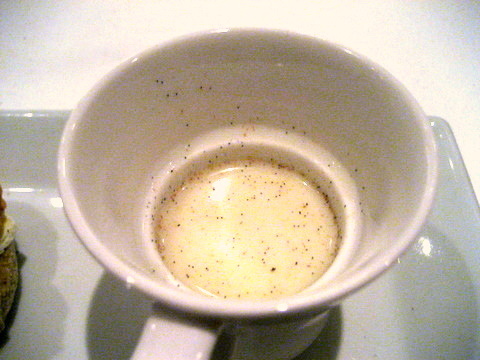 The cup held a saccharine biscotti soup that tasted strongly of vanilla and cinnamon. Despite using a traditional combination of ingredients, flavors didn't harmonize well leading to a dull ineffective course. Overall, I thought most of the courses tasted quite good though the restaurant does not take as many risks with flavor as say Alinea. In fact, while Moto may have innovative preparations, the actual dishes are heavily based on classics: French onion soup, buffalo wings, Cuben and Reuben sandwiches, and tiramisu to name a few. My major complaint was that a number of the courses were too salty. The couple at another table seemed to agree with me and they made sure everybody in the dining room knew exactly how they felt. Midway through the dinner they loudly asked the waiter to taste a course to verify how salty it was. At this point they were still saying the food was very good, just a bit salty and they wanted the waiter to verify their impressions. The waiter politely declined to try their food but did tell the kitchen to tone down the sodium. After I ate the beef, I mentioned to my companion they are going to kick up a huge fuss about the mushrooms and sure enough they did. This time they demanded Chef Cantu come out and taste the food. When the waiter informed them Chef Cantu wasn't in they went ballistic, decrying the restaurant as a scam, and insulting anyone who might have had the smallest roll in preparing the food. The waiter seemed to want to exit the conversation as soon as possible and offered repeatedly to comp the meal. Instead of being mollified the couple seemed insulted and insisted they weren't trying to skip out on the check but it was their RIGHT as paying customers to tell the chef how pissed off they were. Eventually the couple stormed out, though I didn't see if they paid or not. 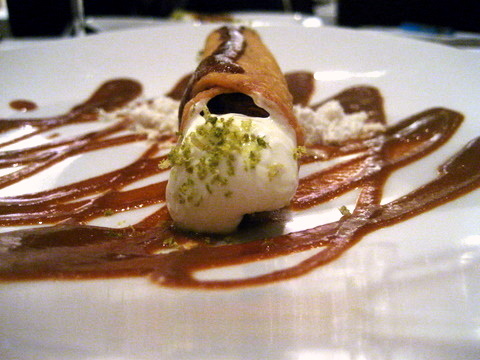 The food at Moto was definitely not as refined as some of its Chicago brethren. 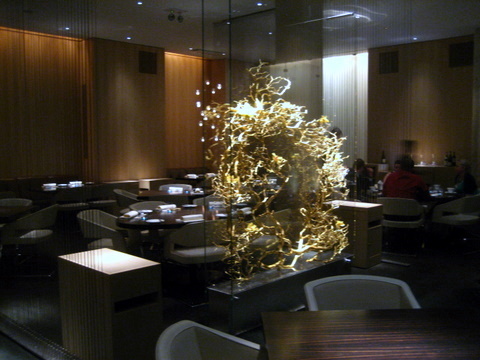 In fact, Moto is largely regarded as one of the weaker Chicago restaurants in terms of food, far below luminaries like Alinea or Tru. In terms of food alone, I agree, the restaurant plays it very safe which means none of the highs or lows, just mostly good food. 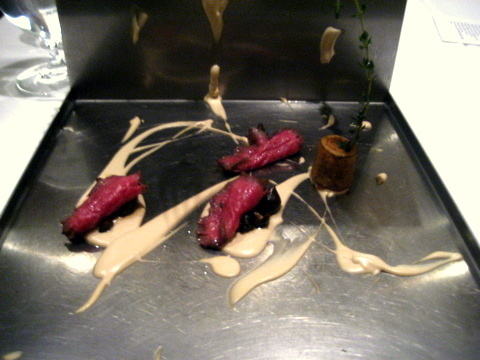 Still safe is boring, I'd rather have two misses for every one hit at Alinea and have them all be memorable than the steadily solid food at Moto. Where Moto shines is in the presentation and overall experience; like the feel of eating paper, or scrambled eggs made from carrots and EVOO, or even a s'more cleverly shaped like an Acme explosive. 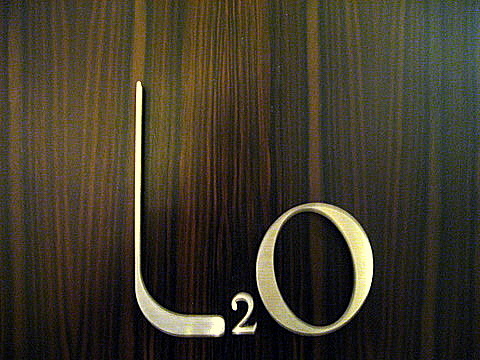 L2O burst onto the dining scene in May 2008 and was nominated for a James Beard award for best new restaurant in 2009. 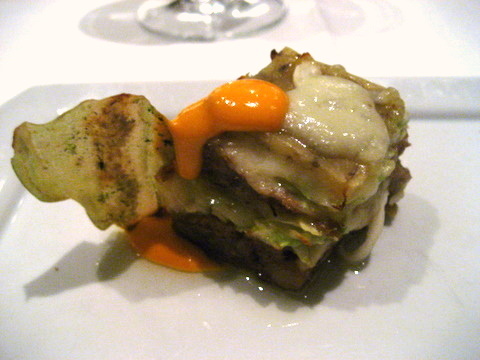 Though L2O lost to Momofuku Ko, that in no way diminishes the impressive work Chef Gras has done in such a short time. The brainchild of Chef Laurent Gras, L2O blends Chef Gras' French training under Michelin starred luminaries like Alain Ducasse, Guy Savoy, with influences he picked up during a stint in Japan. 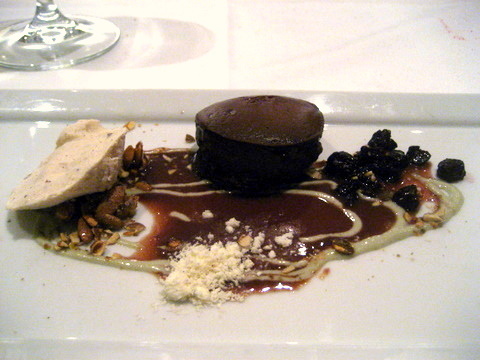 The restaurant offers 4-course, 6-course and 12-course courses in the main dining room. The restaurant has a contemporary interior dressed in warm ebony wood with white leather chairs and clean stark lines that suits the menu perfectly. 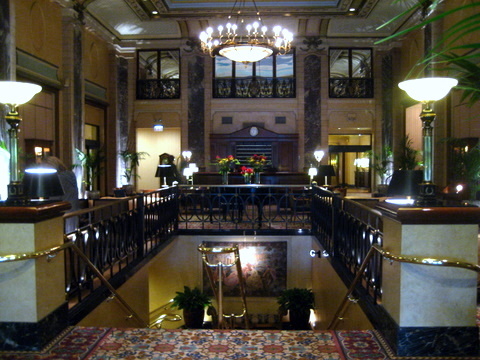 The restaurant seems a bit out of place compared with the stuffy old world trappings of the hotel lobby. In addition to the above menus, the restaurant also offers a "secret" 14 course (19 by my count) Kaiseki served in a private tatami room by a pair of kimono clad servers. The Kaiseki menu struck me as the mirror image of the main dining room, traditional instead of contemporary with a French-inspired Japanese menu rather than a Japanese-inspired French menu. 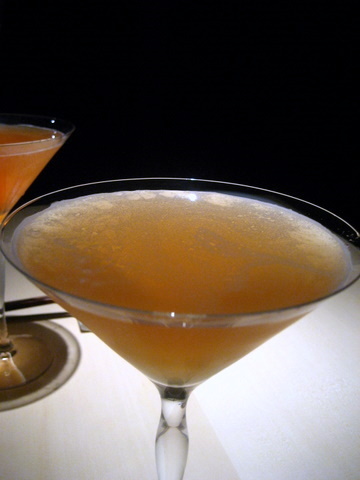 The light citrus notes of the lime cordial are immediately apparent, though the bitter orange of the Aperol makes itself known in short order, the cocktail effectively uses liqueur to add some complexity and weight to the mix. Sort of the opposite of the above drink, the woody smoky Calvados apple brandy was immediately apparent though on subsequent tastings, I noticed the tempering influence of the Beerenauslese's honeyed character. 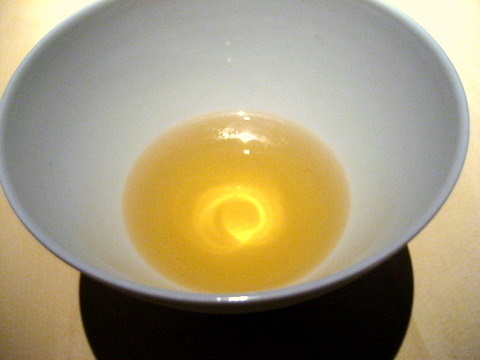 The flavor of sake overwhelms the palate on the attack but that is quickly replaced by the dry brine from the oyster. I suspect the sake marinade muted the natural sweetness of the shellfish, leaving only the lingering flavor of the ocean. A prime example of top quality tuna, presenting a clean fresh flavor and tender texture. 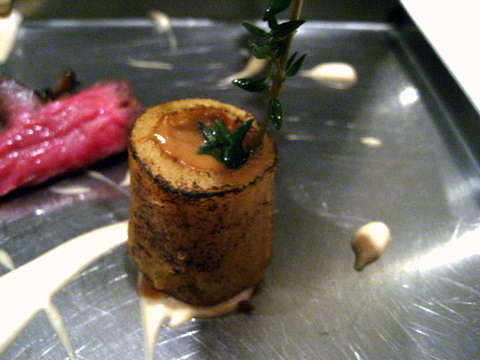 The foie gras had a texture akin to ice cream, almost melting in the mouth, though I would have liked the liver's unctuous flavor to be more apparent in the dish. 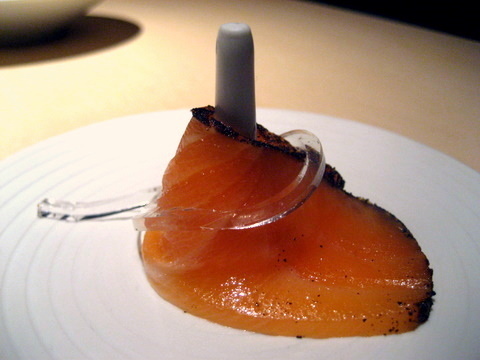 Very tender smoked salmon definitely the focus of this bite, the Earl Grey dusting the edge of the fish was almost peppery in nature, a light flavor but a gritty texture that tingles the tongue. The ginger noodle was totally superfluous. 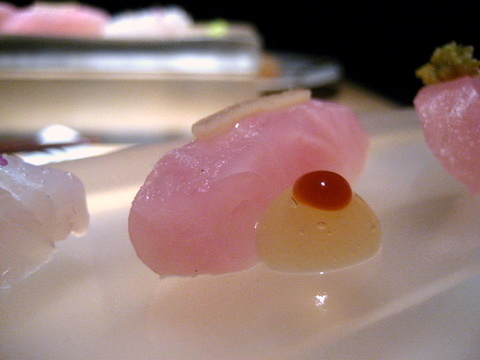 Basically fish ham, the Escolar had a denser mouthfeel very reminiscent of pork and a salty savory flavor to match. 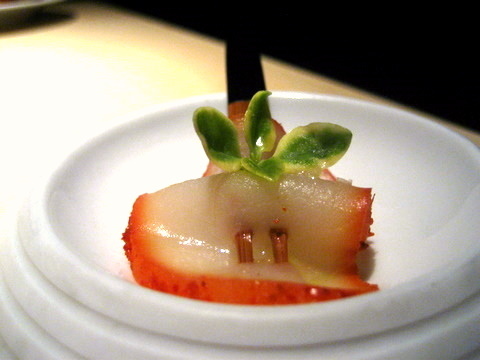 The green sprout resting atop the fish added some moisture and a contrasting vegetal note. 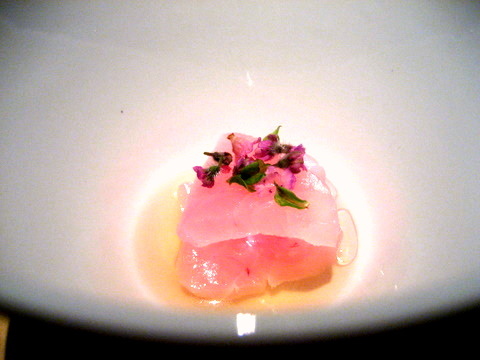 The last of the five amuses was a bit of Kinmedai served with shiso flower and ginger oil. 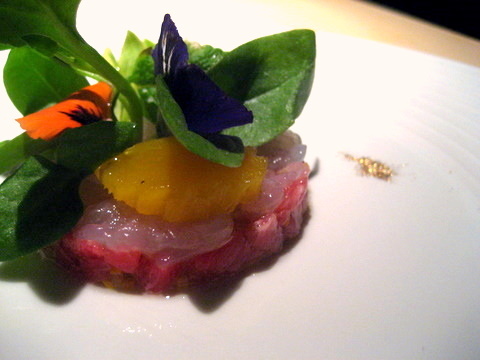 The shiso gives a sweet mintiness to compliment the oiliness of the fish. 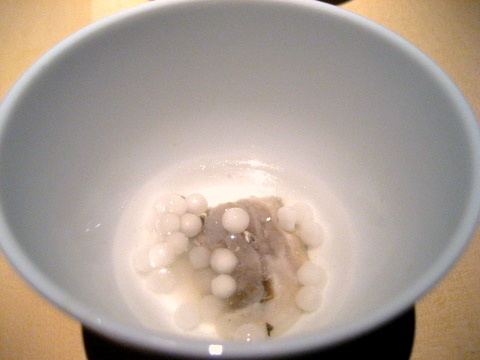 When taken with the ginger oil the fish had a rich sense of umami to it. The wine was a sparkling GV from a producer known for making sparklers out of non-traditional grapes, indeed the mineral driven Sekt worked nicely with all the lightly flavored fishes. 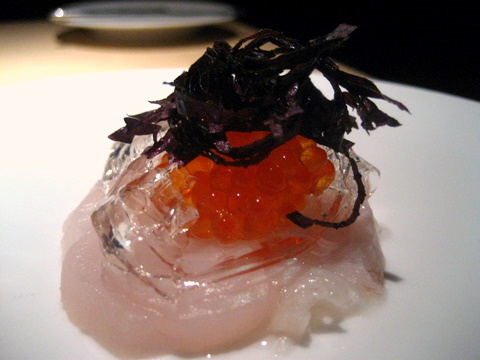 The medai had a firm texture and mild flavor, relying mainly on the firm ikura and shiso flower for flavor; once again the ginger noodles seem more for decoration than anything else. This dish seems to need a bit more polish, the ikura and shiso flower don't work in harmony, with only one flavor apparent at any given time. 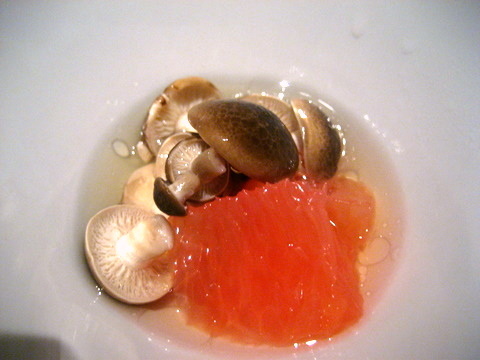 When taken with the wine, the fish developed a fishy almost oyster-like character. We were given a reload on bread with one new entry, an Asiago Cheese bread, creamy and mild with the cheese providing a nice weighty richness. 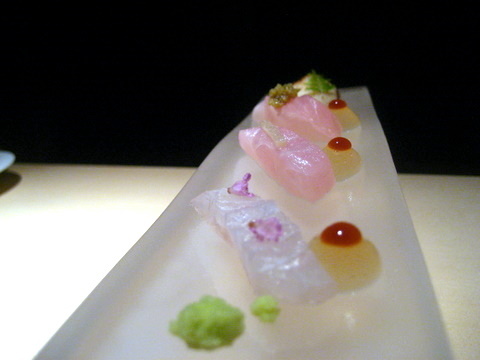 We were given three types of Sashimi: Fluke, Kinmedai, Shima Aji each with a dollop of ponzu and soy gelée as well as a Soy Meringue. The fluke was the lightest of the three fish, a canvas for the sweet-savory notes of its accouterments. 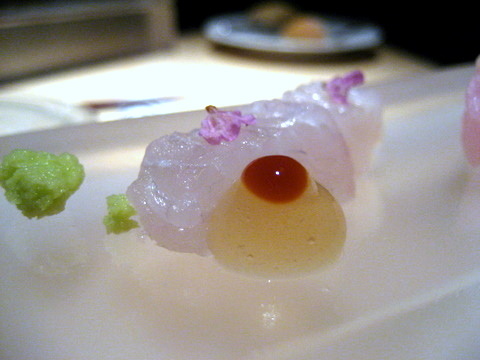 The Kinmedai was similar, really highlighting the fish in unison with the candied ginger, soy, and ponzu. 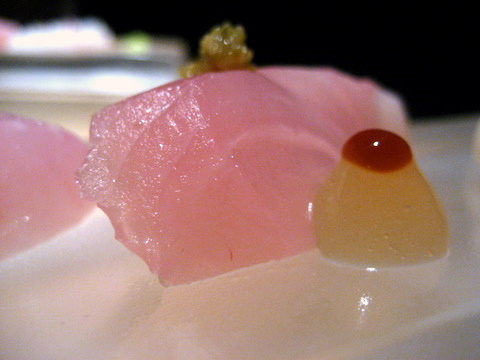 The shima aji was my favorite of the three, with the yuzu kocho a wonderful accompaniment to the rich flavor of the aji. The Meringue was more like a sticky foam and tasted reminiscent of Chinese beef jerky with a grassy twist from the leafy green. I was a bit surprised how well the Silk worked with the fish. Typically I prefer a drier sake but the bolder flavors complimented the intensity of the ponzu and soy gelée paired with the fish. I recorded this as English Pea but the menu lists the vegetable component as Asparagus. 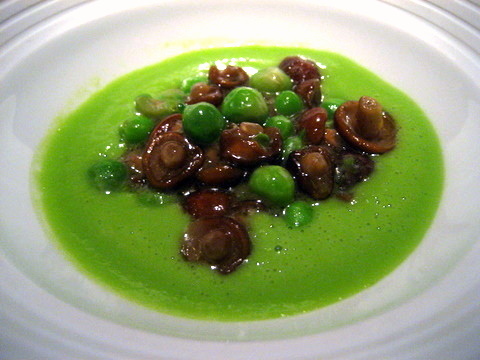 Regardless the dish possesses a charming interplay between the earthy mushroom and the light grassy sweetness of the vegetable. I wish they did a bit more with the course but the straightforward combination is by no means unpleasant. The riesling paired with this dish emphasized the sweet side of the dish, plenty of apple and ripe fruit make for very easy drinking. The house made tofu is so soft it is difficult to pick up without breaking it. The delicate tofu has a surprisingly strong flavor on its own but taken with everything else serves as a base for the white soy and ginger with a smoky finish from the Itogaki, which is a dried tuna similar to how Katsuobushi is made from dried bonito. The octopus is very meaty with an almost sausage like flavor, the floral olive oil and sweetness of the coconut alleviate some of the heaviness of the dish but I was still left thinking this was a bit blunt. The wine is laden with aromas of tropical fruit and exotic flowers as well as a pronounced coconut aroma that matches well with the dish. Surprisingly for such a powerful fruit driven nose, the flavor is fairly dry. 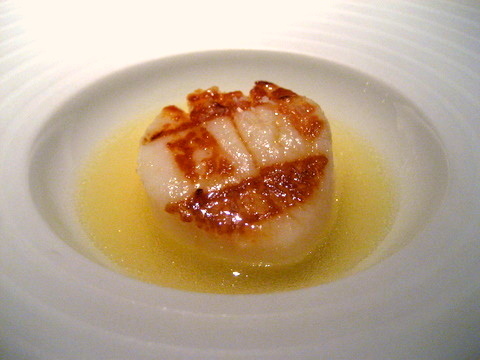 The scallop was nicely cooked uniformly smooth and tender with a nice caramelization. The champagne brown butter filled the room with a rich sweet aroma though the flavor emphasized the tartness of the champagne. 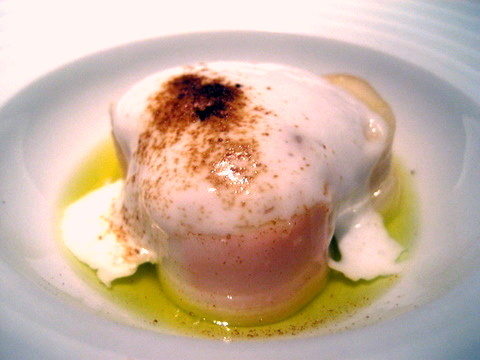 Infused with a subtle sweetness from the scallop, the soup might have been better than the scallop itself. Though the wine is listed with the next course, the Eisenthur had aromas of red apple and orchard fruit with a caramel flavor on the palate, reminiscent of a dry dessert wine. 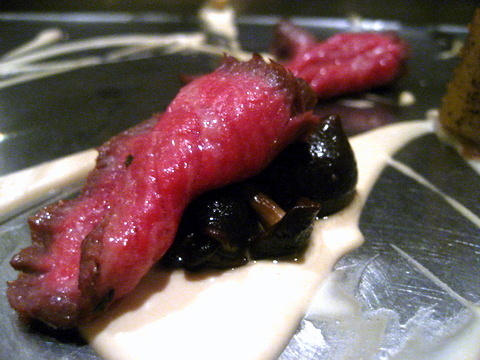 Probably my favorite course of the night, this was my first experience with raw lamb which ended up surprisingly firm with a satisfyingly chewy texture. The shiro ebi was a beautiful pairing, adding a creamy complexion and mild sweetness to the lamb. 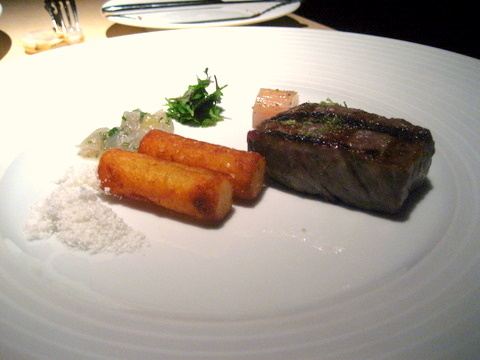 The whole amalgam was set off by the peppery herbaceous vegetables and tinged with gold powder for extra luxury. 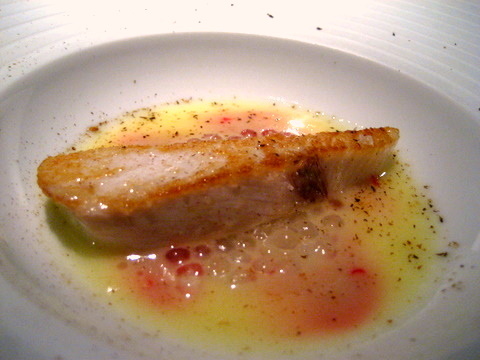 Kampachi is a difficult fish to cook and this turned out to be one of the weaker courses of the night. 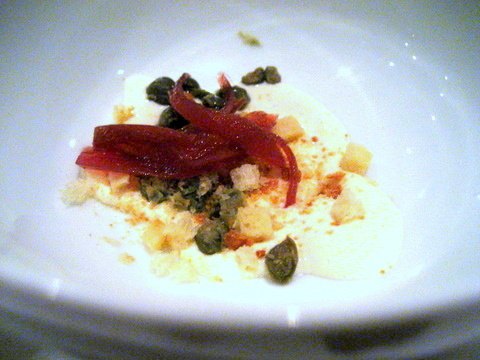 The fish was a bit dry with a funky oiliness that I didn't care for though the flavor was somewhat blunted by the yuzu. The snappy texture of the squid makes the lobster seem tender by comparison though both were quite firm and the actual differences were very subtle. 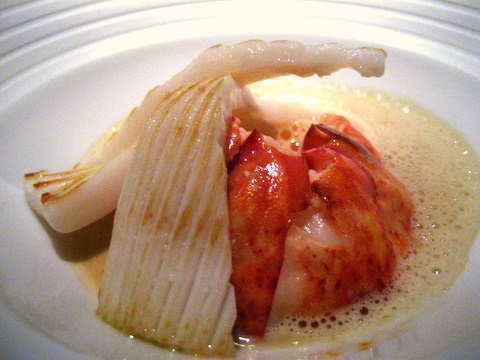 Wonderful pairing of the foie to give some heft to this dish, a heavier preparation of lobster than most and a very nice departure from tradition. The wine paired with this dish emphasized more of the smoky elements making it a heavier pinot and an appropriate pairing for the shellfish. 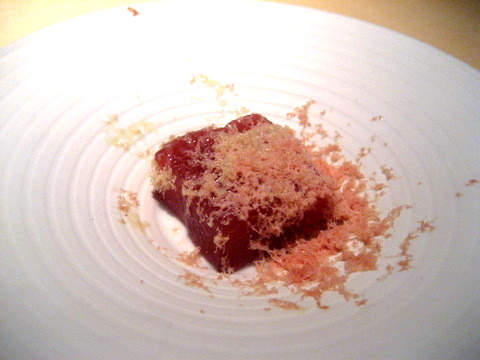 A very nice cool palate cleanser (though not actually the last savory) with the grapefruit coming to the fore. The pickled mushrooms add a complimentary tartness but the characteristic earthiness of the mushrooms is more of an afterthought, serving to ground the vibrant acidity of this course. A fairly lean example of Waygu but still possessing abundant marbling, the tender flavorful sake marinaded beef makes for a very satisfying steak especially when paired with the grilled scallions. The accompaniments are all quite good particularly the scallion, with the interplay between the sweet onion and rich beef reminding me of an In-n-Out burger. 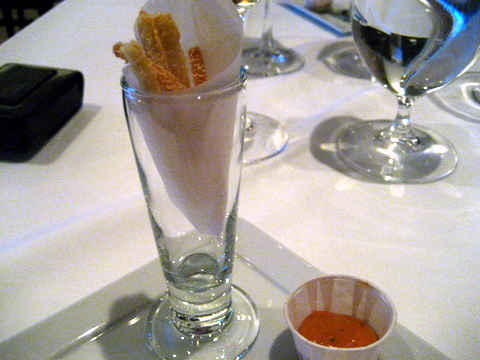 I also really liked the potato batons though I am not sure why as they just seem like fried potatos. The wine has plenty of dark ripe fruit on the nose, with some notes of saddle on the palate, a multifaceted wine that pairs nicely with the beef. It seems a bit strange to be given a bowl of dashi soup to close such an elaborate dinner but the simple soup does a nice job as a gentle satisfying palate cleanser. A very rich simple dessert, plenty of sweetness, a nice cold flavor from the caramel ice cream filling and a buttery crunch from the praline bits below. I could eat a dozen of these. Simple, pure, sweet what dessert was meant to be. 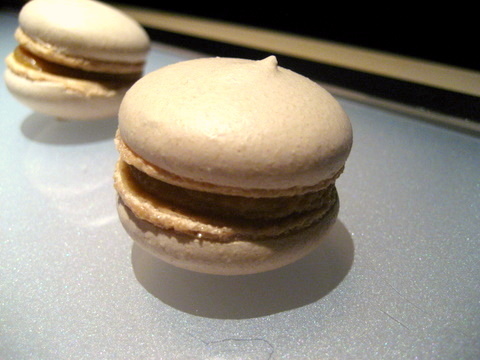 The macaron had a similar flavor to the previous dessert with a slightly salty twist. The cookie part of the macaron had a crisp exterior and airy sticky interior, that reminded me of Macarons a friend brought me from Ladurée. 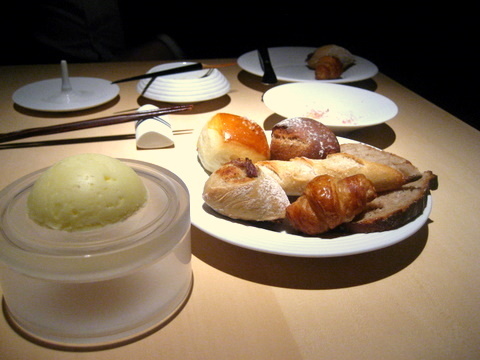 This is not a strictly traditional Kaiseki meal by any stretch of the imagination, incorporating Western elements like bread and wine pairings. The food is very good though not outstanding, but dining in the tatami room is about the overall experience. 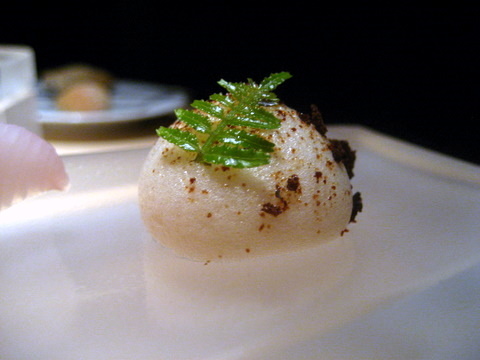 The meal emphasizes balanced flavor pairings as well as an extraordinary dedication to presentation and service, all hallmarks of the Kaiseki tradition. If I were to return, I would like to try the main dining room though I could see myself coming back to the tatami room for a special occasion.